Paul has taken a four-day weekend in celebration of Thanksgiving. Yesterday we stuffed ourselves so full of turkey that I’m surprised we didn’t start GOBBLING. Now, we’re going to relax, watch a movie, and enjoy each other’s company. 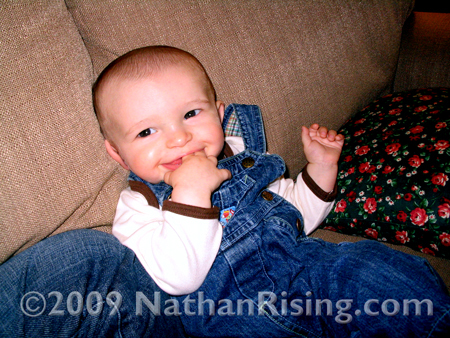 But not before I share some pictures of Nathan on Thanksgiving! Like I mentioned yesterday, he didn’t take his nap so he was a bit moody. I had to take some pictures of him to cheer him up because he’s a rare breed and actually loves having his picture taken. So I got out the camera, and a huge smile brightened his face. I thought taking just a picture or two would do the trick, so I put the camera away after a handful of pictures. So I turned the camera back on, but he wasn’t quite ready to forgive me for my transgression. He looked at me with Pouty Eyes that didn’t understand why I would put the camera away when we were having so much fun. So after taking a few more pictures, his pout disappeared and he was grinning like a champ again. He looked lovingly into my eyes as if to say thank you, Mommy. Thank you for reading my mind and taking more pictures of my awesome self. After a few more clicks, he actually started posing. Like a miniature model. Hand behind the head and all. He’s learning all the tricks on how to keep me taking pictures of his Awesome Cuteness. Hope you all had a wonderful Thanksgiving and are enjoying your holiday weekend! 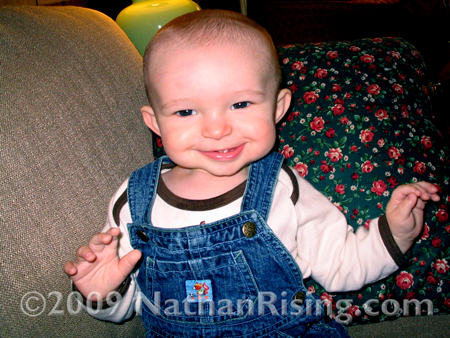 This entry was posted by Jen on November 27, 2009 at 10:37 pm, and is filed under All About Nathan, Holidays and Special Occasions. Follow any responses to this post through RSS 2.0.You can skip to the end and leave a response. Pinging is currently not allowed. Oh my goodness he is absolutely adorable! I love his smile! And you are SO lucky that he loves pictures! Happy Thanksgiving! 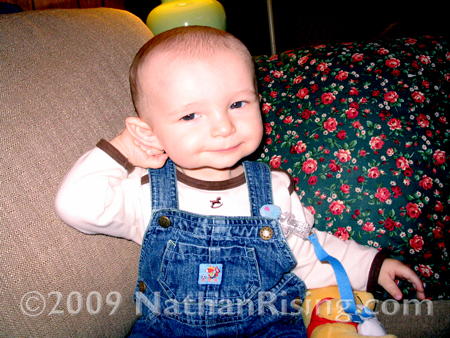 .-= Brittany at Mommy Words´s last blog ..A Whole New Miles =-. Thank you!! Yeah, I’m pleasantly surprised that he loves having his picture/video taken. Most babies that I’ve known didn’t particularly care for it! Thank you! 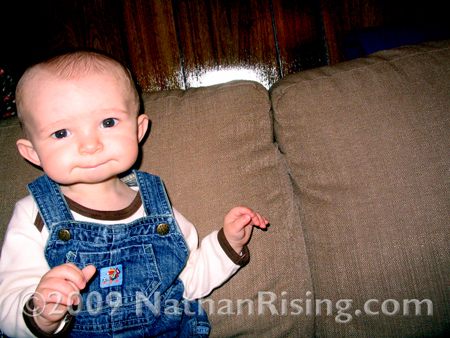 He really keeps us laughing with all his antics… I’m glad I started blogging so I now have a record of some of his most amusing and adorable moments. Well, and some not-so-adorable moments as well.